This entry was posted in Racing and tagged q on May 24, 2009 by Steve Tilford. Another Muscatine Criterium in the books. The course is in Weed Park above the Mississippi. Pretty nice setting. The course is 40 laps of a mile course that is down for a third, up for a third and a third flat. The flat portion has a couple corners with a hairpin 150 meters before the finish. Nearly 140 guys lined up for the start of the PRO 1-2 race. The race seemed kind of destined to be a field sprint from the gun. Too many pretty fit guys. And the momentum at the bottom of the descent ate breaks alive. I was riding like yesterday most of the race. Pretty flat. Covering stuff I thought I should cover. But suffering doing it. With 10 laps to go, everyone seemed to be getting pretty beat. The humidity was pretty high. The temperatures in the 80’s, which seemed hot. Anyway, it was easy to sense that the field was struggling. I finally made a decisive split with 8 to go. But, Eric Marcotte was in the move. And he wasn’t really pulling. He is pretty much faster than me and I wasn’t willing to sprint out of a small group with him. I need a lot more traffic and commotion to beat him. One on one I’ll lose most of the time. Anyway, the field was splitting behind and I was pretty rested by the time Brian came up in a small group with 2 to go. Then the field reattached sometime soon after, but they were done. I jacked up the sprint again. I’ve never executed a good sprint at this race. The sprint is to the last corner. Brian tried to lead me out, but the commotion that I was looking for earlier got involved. I was buried 100 meters before the corner, but had a bunch of juice left. 20 meters before the final corner I was 8th and went into the hairpin 4th, with way too much speed. Ended up on the far curb going about 5 mph and by the time I got back up to speed I was lucky to loose only one place, finishing 5th. Chad Hartley won for the 2nd time in 3 days. Eric was 2nd by 1/2 a wheel. Tomorrow is Rock Island. Big $$$ race of the weekend. Doesn’t seem like with all this criterium riding I’m getting anymore leg speed. Yesterday I quit taking the antibiotics that were prescribed for a month. I took them for 10 days. I figure they is way too much racing going on the next month to be suffering like this. And I have to blame it on something. We’ll see. Only photo from today. 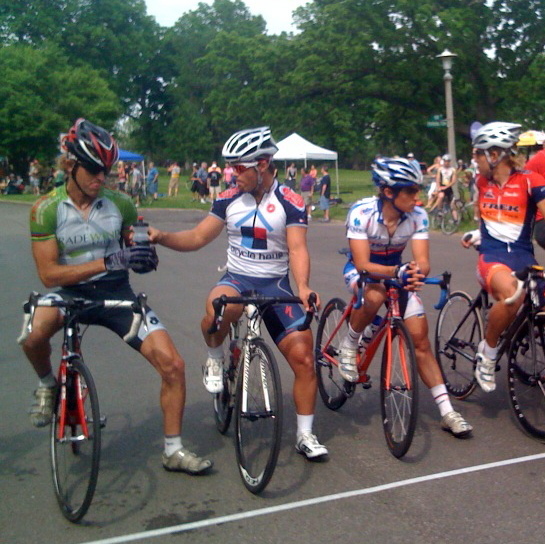 Sharing water during rider introductions with Eric Marcotte (notice the sprinter legs-his, not mine).